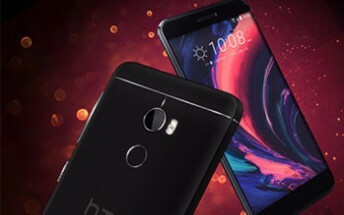 Yesterday an official-looking poster for the upcoming HTC One X10 got leaked, and it promised us a "bigger battery". We were intrigued, for sure. Today a couple of additional promotional materials for the One X10 have been outed, as you can see below. And one of these thankfully clears up the mystery regarding the device's battery capacity. It's 4,000 mAh. That's great for a handset that should come with a 5.5-inch 1080p touchscreen, as per previous rumors. The One X10 will supposedly be powered by MediaTek's Helio P10, aided by 3GB of RAM. 32GB of storage will be built-in, and a fingerprint scanner can be seen on the back. The main camera is allegedly a 16 MP unit, while an 8 MP snapper will take care of selfies. HTC will probably make the One X10 official soon, given that its promotional materials have started leaking already. Hopefully the company manages not to overprice it.